This isn’t a recipe as such, more like an assembly of all things delicious. At my work, me and one of my colleagues has started to cook for the rest of the team. So far we’ve many slow cooked sous vide chilli con carne with chorizo, treacle and chocolate, Chinese broth with pork dumplings and chicken noodle salad. This dish has to be one of my favourites. It’s light, vibrant and darn tasty. 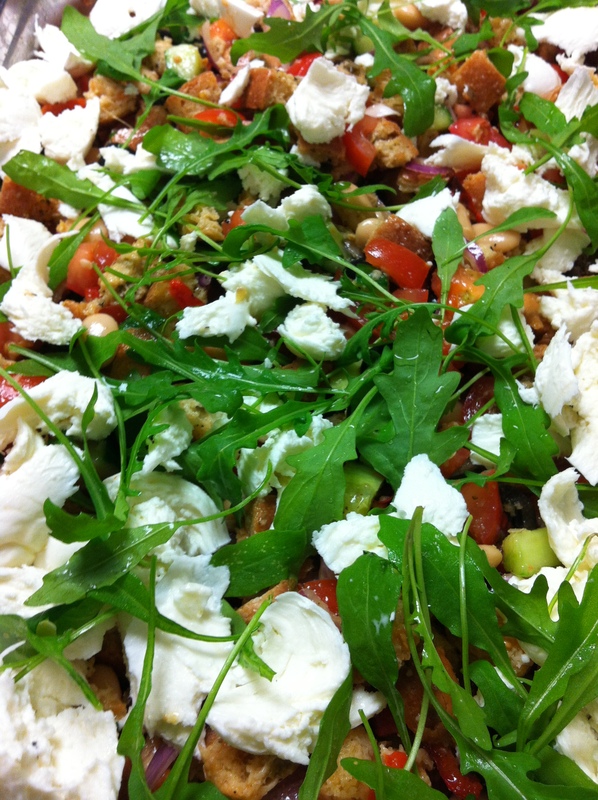 So much so we ended up doing a huge tray of this salad to feed most of the factory workers too! 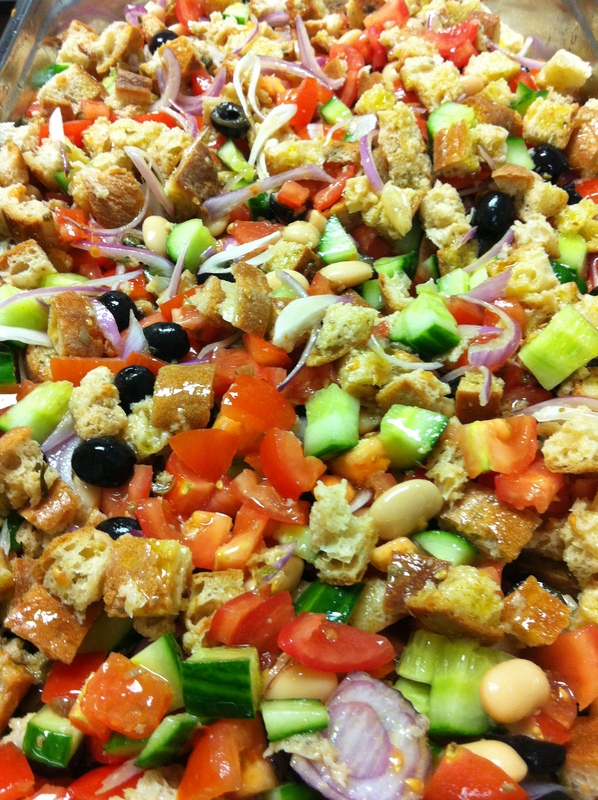 Panzanella salad is an Italian salad traditionally using stale bread with tomatoes and olive oil to make a great summer salad. We added a ton of extras which I think most Florentines would frown upon but it went down a storm here. If there isn’t any of the extras your like, have a play with what works well for you. Fresh peach wedges, char grilled courgette strips, parma ham or asparagus, no limit! In a huge tray or bowl, tip in the ciabatta, top with the tomatoes and all of the juice from cutting them, then add all the ingredients except the basil, mozzarella and rocket. Using your clean hands, get stuck in and mix it all up. Squish up some of the tomatoes, you want the juices from all the ingredients to soften and flavour the bread. Drizzle liberally with olive oil and season to taste. When all mixed well. Cover and leave at room temperature for 30 mins to a couple of hours for the flavours to warm and amalgamate together. When ready to serve, top the salad with the torn mozzarella, basil and rocket. Drizzle over some balsamic vinegar to taste and serve with a huge smug smile! wow very tasty and spicy salad. i like to eat salad.its very useful for our health.we should use it daily in lunch time.i also use it in lunch time.anyway thanks for this great sharing.